New Delhi/Imphal: National Investigation Agency (NIA), on Friday last week, arrested Manipur MLA Yamthung Haokip in the Missing Arms Case pertaining to the theft of 56 Pistols and 58 Magazines from the DG Pool Armoury located within the premises of 2nd Manipur Rifles Battalion at Imphal. The weapons went missing between 2016 and early 2017. 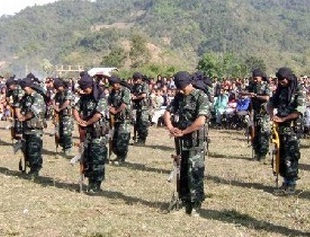 NIA also has arrested Kuki Revolutionary Army (KRA) Chief David Hangshing, a resident of Dewlahland, Imphal East. Operations (SOO) agreement with the Government. Investigation into the case has established the complicity of David Hangshing, who is accused of undermining the democratic process of the country and waging war against the State. Based on the evidence, David Hangshing was arrested by NIA on 24 August 2018 at around 3:45 pm. During interrogation, David Hanshing disclosed that a few of the missing pistols were kept hidden by him at a certain place. An NIA team recovered six missing 9 mm pistols from that place, about 20 km from Imphal under East Imphal Police District. matched with serial numbers of the missing pistols The serial number of 1 pistol had been erased. david Hanshing has been remaned to POlice custody. During the course of investigation by NIA, one of the missing pistols bearing no. 18506735 was recovered at Mantri Pukhri, Imphal on 30.07.2018 during the search at the residence of Yamgthung Haokip, MLA from Saikul Assembly Constituency. During investigation, sufficient material and other evidences have been collected. These establish the complicity of MLA Yamthung Haokip in the Missing Arms case. Yamthung Haokip was arrested on 24 August 2018 for his involvement in procuring police pistols illegally and distributing them to different terrorist groups to wage war against the State. Custody. Owing to his recent illness, NIA Judge ordered Jail Authorities to admit him in Government hospital. NIA has recovered 14 weapons till date. During searches nine 9 mm Pistols were recovered and seized from the residential premises of Soson Haokip at Mantri Pukuri, Imphal. The Pistols are believed to be from the same lot that went missing from the Police armoury at Imphal. Till now, 14 Pistols have been recovered from different accused persons. Efforts for recovery of remaining Pistols are on.